(l-r) Eugenio Derbez as Leonardo and Anna Faris as Kate in OVERBOARD. ©MGM / Pantelion Films. CR: Diyah Pera. 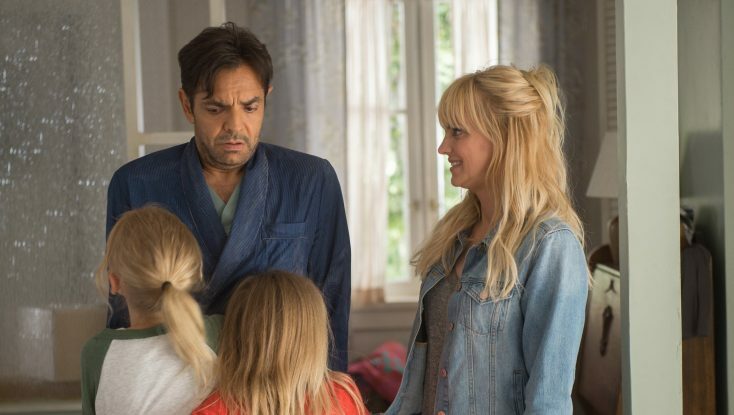 HOLLYWOOD—Eugenio Derbez, who co-stars in a remake of the 1987 romantic comedy “Overboard,” with Anna Faris, wondered for a long time what Goldie Hawn and Kurt Russell, the stars of the original film, would think. A producer and co-star of the new version of the film, Derbez had a few opportunities to discuss the film with the Hollywood legends, but didn’t. After all, he figured he was walking on hallowed ground because the celebrity duo’s onscreen romance blossomed into a real-life relationship that has lasted decades. Derbez, a huge star in his native Mexico, was excited to bring on Faris, the blond, blue-eyed comedian best known for recurring role in the horror parody franchise “Scary Movie,” and the popular TV series, “Mom.” He thought she strongly resembled Hawn and had the comedic chops to pull off the performance in the remake. In the “Overboard” remake, his character, Leonardo, is a spoiled, rich bachelor who loses his memory after an accident. Faris plays Kate, a cleaning woman on the yacht who is treated rudely by her employer. She puts up with Leonardo’s abuse because she dealing with some serious economic hardships. Her best friend, Theresa (Eva Longoria), helps her concoct a plan to use Leonardo’s memory loss to her advantage. Bob Fisher and Robert Greenberg wrote and directed the remake based on Leslie Dixon’s original story. Q: The key to a successful romantic comedy is chemistry. When did you know you two would work well together? Derbez: We found the great chemistry since day one, right? Derbez: She was awesome. We would read together. You like me and I like you. Faris: It’s the school of big-eyed acting. It was seven months before we started production that they asked me to come in. I don’t know if you were familiar with my previous works, “Scary Movie1, 2, 3, 4.” Not five I hope. Derbez: Yes. I was a huge fan of Anna. But you know when you meet your co-star, you never know what’s going to happen, sometimes. You have to work with her. Faris: I can’t imagine you not having chemistry with somebody else. Derbez: No way. You were so easygoing and so smooth and everything. Faris: Until you made me get into the water again. Derbez: She’s a trouper. She went into the cold freezing water many many times, and I didn’t. Faris: I like to bring that up—the passive-aggressive wife. Everything she has to do for you. Q: How did you cast Anna for this role? Did you have her in mind all the time? Derbez: She’s exactly like Goldie Hawn. She looks like Goldie Hawn when she was young. I told her I was in love with Goldie Hawn when I was young. Faris: Yes, I know, and that makes me jealous. Derbez: Goldie Hawn was my movie star crush when I was young and she looks like Goldie Hawn. You look gorgeous. And we love her. We think she’s one of the funniest comedians in this country and we’re lucky to have her in this project. Q: Did you have posters of Goldie Hawn in your bedroom while you were growing up? I said, “No. What if she thinks I’m not as handsome as Kurt Russell. I don’t know.” I was really scared. She told me, “Tell her. Tell her,” but I didn’t have the guts to. Faris: We’ve been doing so much press and this is the first time I’ve heard this story. Faris: What restaurant was this? I want hear about that fancy place. Derbez: It was in the Palisades (an upscale Los Angeles neighborhood). I just heard this morning that you had dinner with them. Faris: Yes. I was in London with Chris (Pratt, her ex-husband) and Kurt (Russell, who played Pratt’s father in “Guardians of the Galaxy, Vol. 2”). It was over a year ago. I know this sound so obnoxious to a person reading this who’s not in the entertainment industry. I would be vomiting. But he said, “We’re going to dinner.” It was not (phrased) as a question. He said, “I heard you’re doing that movie.” And I was like, “What is this? The most terrifying dinner.” A few hours before, my palms are sweating. Are they going to say something terrible? The way he presented it, it felt like I had my work cut out for me. By the end of dinner, they were all happy. Kurt was, “Alright, we give you our blessing.” He picked up the check. It was really nice. It’s a movie I really loved growing up. Q: Did you talk about the movie? Faris: We did. We talked about their experience in the movie, which was a lot of love and joy they had making the movie together. Derbez: Were they happy with us doing the remake? Faris: Yeah. That’s the impression I got. Q: What were some of challenges in making this film? Faris: (quips) Well, you’ve got to work on a yacht. I got to jump in the water. Derbez: It’s tricky doing a remake because you want to be as (respectful) as possible to the original movie because you love it but, at the same time, you try do something different to make it fresh and different. I’ve seen some movies that go far from the original and it’s something messy that you didn’t want to do. Faris: Sorry to interrupt you. But don’t you think with comedy, it has to be a progression because comedy is constantly shifting and updating itself? What you guys brought to the table initially was the idea of flipping the stereotypes a bit. I really love that. It’s such a gratifying element. I’m really proud to be part of a movie that does that. Derbez: Yeah. Flipping the roles was interesting because we were breaking stereotypes. I was always thinking if I have the chance to break stereotypes in Hollywood, I want to do that. They always offered me the same roles. You’re going to be a gardener, the cook, the parking attendant, the criminal, the drug lord, or whatever. Now that I had the chance (to produce a film), let’s flip the roles. The natural thing to do was play the role of Kurt Russell’s carpenter. Let’s give it a fresh look. Faris: He wanted to be in speedos on the yacht. We want bikini girls. Derbez: It was really tricky and really hard and risky. It’s a beloved film. I just tell all the people and everyone that loves this movie that is an homage to the original one. Q: There’s a lot of diversity, especially the inclusion of Latinos, in this film. Is that something you’ll be trying to do in other films you produce? Derbez: Thanks for bringing this to the table. That’s what I would like. It’s not like it’s a must in every movie, but I think that’s America. That’s the real America. If you go into any store, you’re going to find Cubans, Mexicans and Chinese. You don’t find that in Mexico. In Mexico, you walk into any place and there are Mexicans everywhere. Here, you find this diversity. That’s life in America. I don’t want to forget about my people. I’m very conscious that I’m here right now and working in this industry because I’ve got my support from my people. They’re the ones who fill the theaters and make the box-office numbers, so I’m really grateful. That’s why I always try to include when I can and when it’s organic—some Spanish, some Latinos. I try to make them a part of my world because they are. It’s a way to recognize their work. Q: Are there any other films you’d like to do a remake of? Derbez: Yes. There are many. I remember the first movie I wanted to remake was, “Being There.” Everyone was saying to me— same as this one— “No, it’s a classic. Don’t touch that one because it’s really risky.” Let’s see what happens with this one and I’ll see. That (remake would be a) perfect vehicle for me. Q: You guys are so funny in real life. Where did your comedic timing come from? Derbez: I got mine from my dad. He was really funny. He wasn’t trying to be funny. He was just funny. He was very serious. Everyone was scared. I learned by watching him, his behavior. He was really funny because he was serious. He would say nonsense and stupid things. Q: How is it going to work with Allison Janney on the TV series “Mom” after she won her Oscar for “I, Tonya” earlier this year? Faris: I am so lucky that I get to drive to work every day and I get to act with my best friend. I love her so much. I’m so happy for her. She did bring her Oscar into work that Monday (after the awards show). I got to hold it. If I’m being honest, it would be difficult if I didn’t like her. “Hmm. Oh. She gets another one.” She showed it off and said, “You want to hold it?” I sure did.